Built in 1894, this structure was originally a school house. Since then, it was the town library in the 1940’s, a recreation center in the 1950’s and 1960’s, and the senior center in the 1980’s. 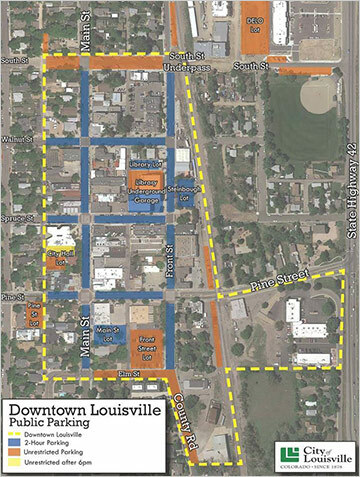 As we get ready for the busy summer season, you will notice some changes to parking in Downtown Louisville. In an effort to create additional short-term parking spaces closer to businesses, the City is changing 74 spaces from all-day to 2-hour starting July 1, 2018. These spots are located in the Main Street parking lot (612 Main Street), a portion of the Library Underground Garage and on-street spaces on Front Street from Pine to Elm. While these spots will not be available for all-day parking, there are many other locations that remain available, including the new DELO lot, which offers 68 spaces for all-day use. Code Enforcement will be monitoring the new 2-hour spaces to make sure that parking time limits are being followed. If you would like to report a parking issue or have any questions, please contact Code Enforcement at 303.666.8634. By Chance will be hosting a Uno de 50 trunk show on July 13. There will be a gift with purchase. Come meet Alex Rodgers from Uno de 50 and check out their new summer and fall line. Extend your 4th of July Independence Day celebration and join us during an art opening reception on Friday, July 6, from 6:00 – 9:00 pm. Meet our feature artists Rochelle Johnson, Susan Behrendt and Jessica Wicken, all coming to us from Denver, and Laura Brenton from Boulder. 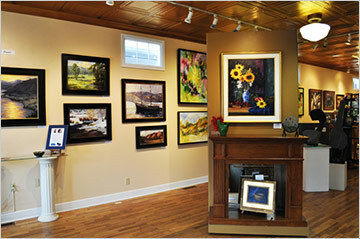 Enjoy beautiful paintings, sculptures, jewelries and photography throughout the gallery. Live jazz music by Scott Martin, delicious snacks, beverages, and great wine! Did you know that Louisville and Boulder County have a thriving independent author community? Come by the Book Cellar to see the diversity of books by all our local authors in kids, teen, and adult fiction and non-fiction! Know an author who might like to sell their book? Have them call 303.604.2880 and make an appointment to sell their book at our store. Happy Summer! 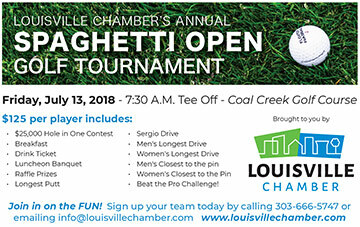 It’s that time of year again to think about golf, golf, golf and the Spaghetti Open Golf Tournament which will be held Friday, July 13th. The price of the tournament is $125.00 per person. Contest for a Cash Prize. (Thanks to Great Western Bank) for sponsoring the “Hole In One” contest.) It also includes breakfast, and a Lunch Banquet with the traditional Spaghetti dinner (donated by the Sweet Spot Cafe) and Sausage (donated by Old Style Sausage), along with great prizes and refreshments. Last July’s event was so much fun that we decided to repeat it this year. 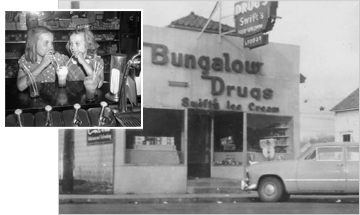 Come sample a float with old fashioned sodas such as sarsaparilla, root beer, or birch beer! Will the Social Security fund last? What impact will my decision have on my income taxes? Can I draw both PERA and Social Security benefits? Get the answers to these, and many other questions, that will assist you in making a well informed decision about your retirement.